Our religion studies concentrate on the roots of Christianity, the Bible, and many of the Catholic prayers such as Our Father, Hail Mary, Glory Be, Guardian Angel, Act of Contrition, Angelus, The Rosary, Hail Holy Queen, and Stations of the Cross. 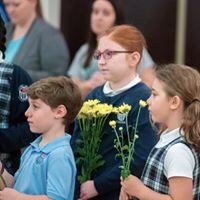 Students participate in weekly School Masses. 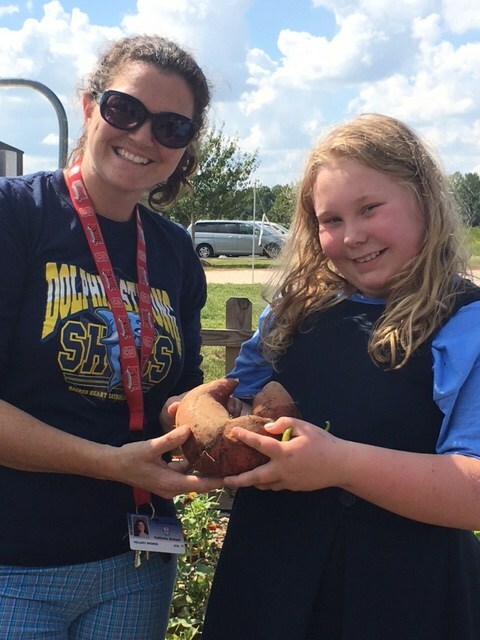 There are several service projects woven into their school year that reinforce helping our neighbor and those in need - canned food drives for our local homeless shelter, volunteering at the food pantry, Christmas gifts for needy children, monthly dress down days for local charities, etc. Our teaching staff really learns the needs of their students through morning intentions and prayer requests, which are a part of every school day. Language Arts: This subject encompasses many areas of learning including reading, reading comprehension, writing, grammar, spelling, vocabulary and rules for punctuation. But most importantly, our teachers help young student minds foster a true love of reading. Statistically, if a child is an avid reader they continue to excel and learn for a lifetime. We utilize a Reader's Workshop model. The whole class is not always reading the same book at the same level and at the same pace. Students are reading on their own. We try to encourage a community of readers making personal choices in reading material with guidance from their teacher. Spelling- Children are taught spelling rules and then how to apply the rules of spelling through explicit instruction. Due to the large amounts of learning in Language Arts in Upper Elementary Grades, we have categorized their learning standards. 3rd Grade Language Arts: In 3rd grade, our students make the transition from learning to read to reading to learn. It is a big year! Our 3rd graders learn what it takes to be a good reader through reading workshops and one on one conferencing. Through reading workshops, students learn what to do when they don’t understand a word or a passage. Students discuss books in small groups and ask questions about what they are reading. Students use interactive notebooks and graphs to organize their thoughts about the books they read. 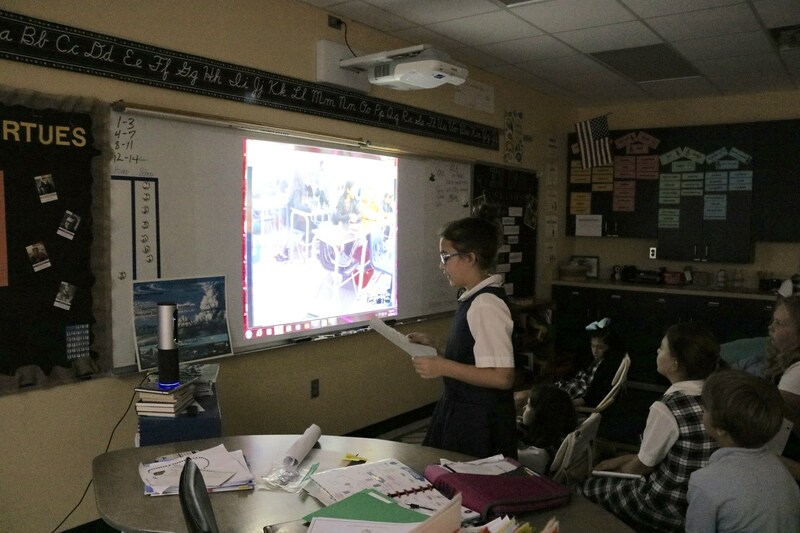 Through conferencing and workshops, students are introduced to many literary genres and a variety of print forms. In Writing, our 3rd graders learn organizational methods that help them prepare for more complex writing assignments. Students go through the writing process by creating webs, maps, and diagrams. Students learn to write persuasive, fiction, and informational writing pieces. After writing, students take ownership of their writing and learn to edit, proofread, and revise their writing pieces. In Spelling, our 3rd graders learn age appropriate spelling patterns, It is important to teach spelling patterns rather than memorization because it unlocks so many more words for our third grade learners. Students learn how to apply the rules and spelling concepts they have learned. Vocabulary in 3rd grade is a cross sensory experience. Students study word parts which allows students to unlock hundreds of thousands of words in the English language. Students learn how to look for context clues through explicit instruction, take their vocabulary to art form, act out their vocabulary, and finally learn synonyms and antonyms. Our 3rd grade students love the word work sessions. Our 4th grade curriculum encompasses all facets of the English language: listening and speaking; reading; spelling; grammar and correct usage; writing, including narrative, opinion, and expository; and handwriting. In reading, students continually read and write on self-selected texts. They also read from a wide variety of genres to study various literary styles and vocabulary, and to improve study and comprehension skills. Students participate in the following elements of the literacy continuum. Several resources are utilized for teaching reading and writing. For reading, students participate in a reading workshop approach. The primary resource used for reading is The Units of Study for Teaching Reading: a Workshop Curriculum (copyright 2013, Heinemann) developed by Lucy Calkins and colleagues of The Teachers College Reading and Writing Project, Columbia University. Using this resource, students enter into complex texts to study themes and see significance in details. In addition to current publications in fiction, students read non-fiction science and social science texts to practice close reading and content area literacy skills. Reading selections are also drawn from MacMillan and McGraw-Hill’sTreasures anthology (MacMillan/McGraw-Hill, copyright 2007). The teaching of spelling is programmed, focusing on word roots, patterns, and families. Students practice cursive handwriting using the Palmer Method of Handwriting where they develop and use muscular movement in handwriting. 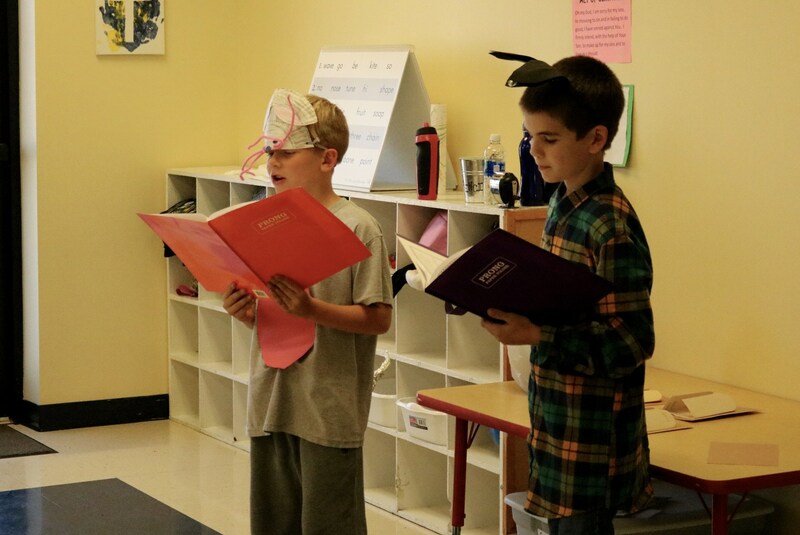 5th Grade Language Arts: The 5th grade reading program is designed to foster a love of reading in our students at a time when many begin to feel the draw of an interactive video game over that of an engaging story. Access to literature books that are leveled in both the classroom and the school library allow our students choice in their reading. Reading skills are taught using the books the students are reading. Picture books are used in the modeling of these skills. "Book Commercials" are a common place in the classroom to share our own opinions of the books we are reading and to encourage others to read the same book. Teacher confer with the students regularly to assess their engagement with books of all different genres. Fifth grades at Sacred Heart study the eight parts of speech and writing. Writing genres include narrative, expository, research reports, essays and letter writing. Children write daily across the curriculum. The writing process is developed beginning in the primary grades. Grammar usage and mechanics are reinforced through writing. Speaking and listening skills are also part of the program, as well as working on library and dictionary skills. A Greek and Latin Root program consists of the weekly study of three Greek or Latin roots and 10 words containing those roots, presented throughout the year in 30 units. The work of each unit is divided into a seven-part structure: definitions, match the meaning, synonyms and antonyms, completing the sentence, analogies and parts of speech. Our students are challenged in math with a rigorous curriculum and teachers follow 2018-2019 NC math standards. Grades 4 and 5 participate in Math Olympiad competitions to encourage excitement for math and improve their strategies for problem solving as well as increase their math creativity and flexibility. By the end of 5th grade, our students have learned addition, subtraction, multiplication and division of large numbers, decimals, fractions and mixed numbers. Word problems become multi-step. Teachers begin teaching geometric concepts such as perimeter, area, angles and volume. Our math curriculum incorporates McGraw-Hill My Math Grades 3-5 which includes enrichment and remediation strategies for our students. Each grade focuses on different themes. Our 3rd grade students focus on the human environment, communities, government and citizenship. 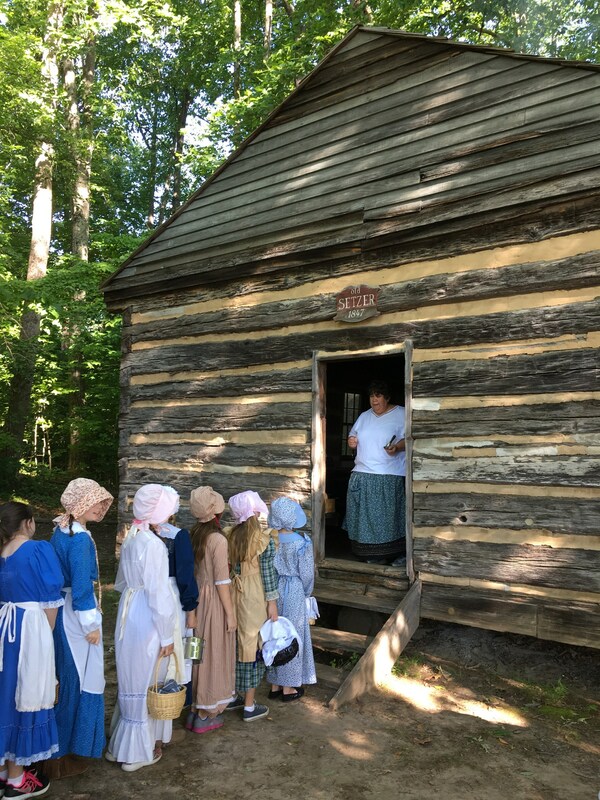 Our 4th grade students focus on North Carolina history and our state's role in early settlement, revolutionary and civil wars, economic development through the years, geographic regions, counties and cities, and cash crops. 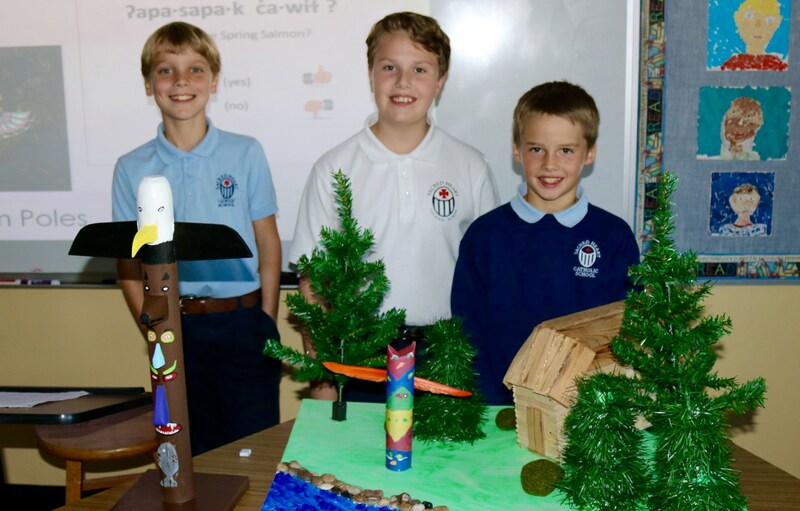 Our 5th grade students focus on American history from Native Americans to Post-Civil War Reconstruction. They learn different perspectives of American history through historical narratives (events, people and places). They study Financial Literacy on a national and global scale. They learn lessons in personal finance. There is also a great emphasis on the geography of the US, along with states and capitals. Students in upper elementary study units in physical, earth and life science with each grade studying in more details.. Topics include: electricity, energy and heat, biology unity and diversity, and ecosystems. 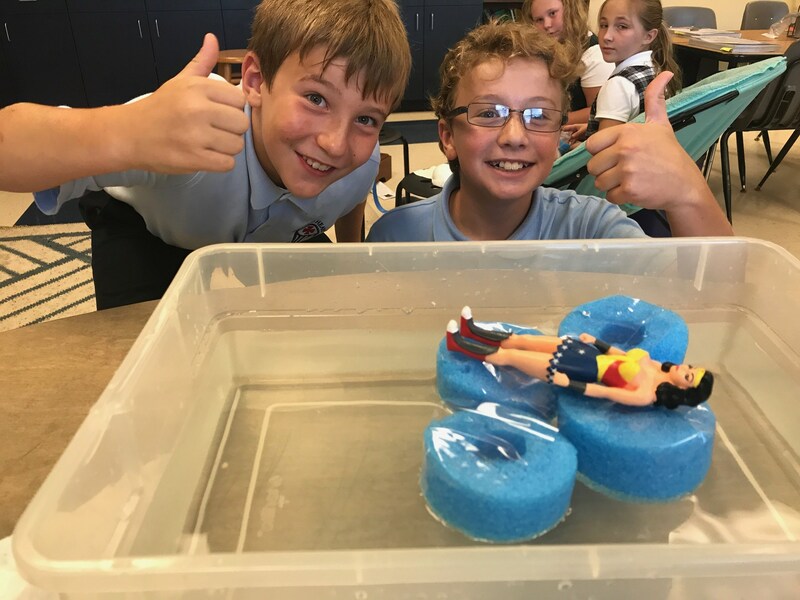 With our STREAM curriculums, there is much emphasis on science inquiry, process, tools and experimentation. Students are challenged to ask questions, discover answers and try experiments more than once. Our teachers use the Pearson Interactive Science with NGSS as well as many additional online sources such as Project Learning Tree, NC Farm Bureau Ag in the Classroom and NC Environmental Education.